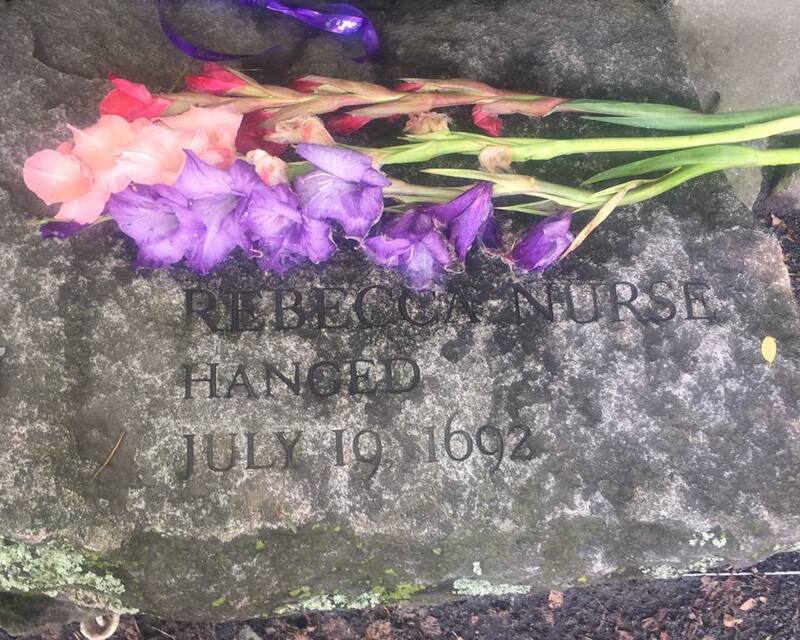 I am a descendant of Salem Witches; my great-grandmother about 13 generations back, Mary Eastey, was executed Sept. 22, 1692 and her sister Rebecca Nurse was executed July 19, 1692. Their mother, Joanna Blessing Towne, had been accused of witchcraft years earlier. For this year's 325th anniversary of the Salem Witch Trials, I've created Salem Witch-related artwork, based on flowers and leaves of the following plants: The "Bog Witch" Sarracenia pitcher plant, the "Witch's Wand" Iris, the "Green Wizard" Venus Flytrap, and the "Bewitching Eyes" and "Salem Witch" Hemerocallis. I AM HERE TO HELP Donald Trump understand what a Witch Hunt actually is. 1) "Lock" as in "Warlock," a male witch. Prior to these five executed witches, six others had already been executed; all six were women. The five executed on this date were one woman (Martha Carrier) and four men (George Burroughs, George Jacobs Sr., John Proctor, and John Willard). John Willard was a law enforcement officer who brought many of the other accused to court. George Burroughs was a minister, who recited the Lord's Prayer while standing at the gallows waiting to die. John Proctor's wife Elizabeth was also among the accused. What do you do when law enforcement, ministers, and husbands of accused witches dare question the court system? Accuse them of being warlocks, and execute them, too. 2) "Lock" as in "Locked Away." Most of the focus of Salem Witch Trial history is on the 19 people who were executed by hanging, and one tortured to death. Sources say about 150 other accused witches were locked away in jail. The youngest, four-year-old Dorcas Good, was jailed for almost nine months, from March 24, 1692, to Dec. 10, 1692. At least four of the accused (Sarah Osbourn, Roger Toothaker, Ann Foster, and Lydia Dustin) died in prison. 3) "Lock" as in "Lock her up!" If you're in a top position of power, like say President of the United States, and you've ever lead an angry mob chanting "Lock her up!" then you're probably not the victim in the "Witch Hunt" metaphor. Salem Witch riding on her broom stick. "18 July 1692. Ann Foster ... confesed that the devill in shape of a [black] man apeared to her ... she promised to serve the divill two yeares: upon w'ch the Divill promised her prosperity ... she & martha Carier did both ride on a stick or pole when they went to the witch meeting at Salem Village ..."
Ann Foster, after days of torture, confessed to witchcraft in an attempt to save her daughter and granddaughter who were also accused. She died in Salem jail in Dec. 1692. "Aug. the 11th, 1692 ... [seven-year-old accused witch Sarah Carrier] said her mother [Martha Carrier] carried her thither to afflict. Q. How did your mother carry you when she was in prison? A. She came like a black cat. Q. How did you know that it was your mother? A. The cat told me so that she was my mother." Based in part on this confession and testimony by her seven-year-old daughter, Martha Carrier was executed August 19, 1692. August 19, 2017 by .